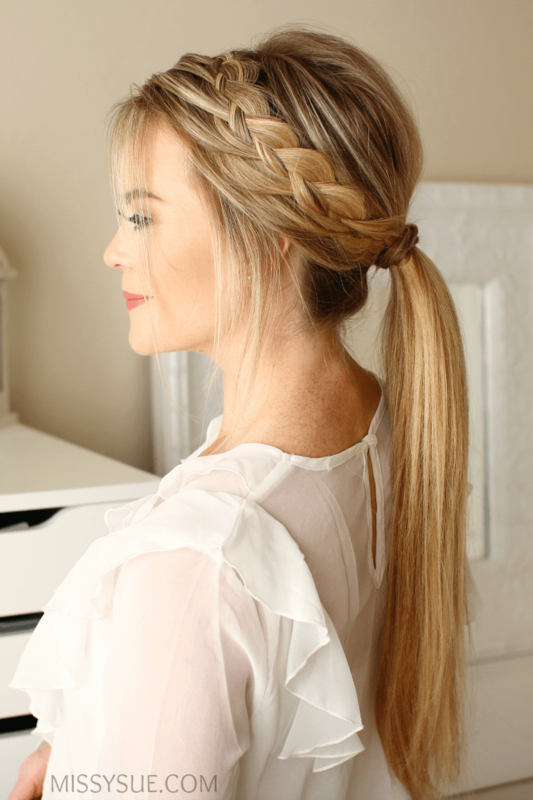 One of my favorite hair tutorials is the Double Braided Ponytail. It looks like such an intricate braid but is actually two braids in one. It got me thinking though, what if it was just one braid? That’s where this braid came from. It looks like a four strand braid but I did both of them side by side and they are definitely not the same. This one has a more woven look and needless to say, I am really excited about it. Hair is just my jam and when a bout of creativity sneaks in and I can create a braid that feels a little different from other things I’ve done then it just reminds me how much I really enjoy doing this. I love doing hair, making tutorials, creating fun and unique styles that other people can recreate on their own. Step 1 / Begin by creating a deep side part on the right side. Step 2 / Pick up a section on the heavy side of the part and split this into three sections. 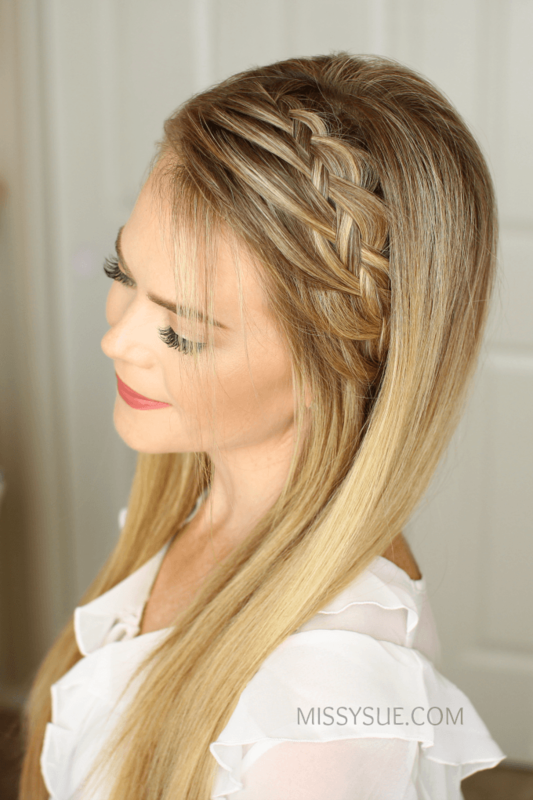 Add some braid paste to the section to help control flyaways. Step 3 / Start a regular braid by crossing the right strand over the middle and then the left strand. Step 4 / Take the right strand and clip this out of the way. Step 5 / Pick up a new section and cross it over the middle in the place of the strand that was clipped away. Step 6 / Cross the left strand over the middle and bring in a new section. 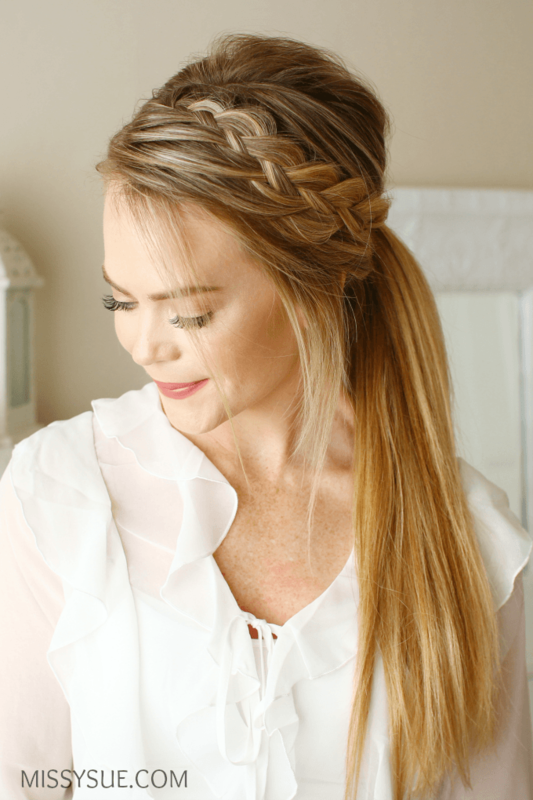 This side of the braid is done like a regular french braid. Step 7 / Bring down the strand that was clipped away and switch it with the new right strand, bringing the top strand under the bottom one. Step 8 / Clipping the second strand (now above the other strand) up and out of the way. Step 9 / Cross the new right strand over the middle and pick up a new section of hair crossing it over the middle as well, just like a french braid. Step 10 / Now with the left side, cross the side strand over the middle and bring in a new section of hair. Step 11 / With the right side, bring down the top clipped piece, cross it underneath the bottom piece and wrap the bottom piece up, clipping it away. Essentially you are switching these two side strands but the top one always needs to go under the bottom one. Step 12 / Cross the new side strand over the middle and cross a new section into the braid. Step 13 / Continue the braid working down towards the left ear and stop adding in hair once it’s about an inch above the ear. Step 14 / Braid the section a little further down and tie it off with an elastic band. Step 15 / Go back through the braid, carefully pulling on the edges to make it fuller. I love doing this so the braid looks bigger and is easier to see. Step 16 / Wrap the braid around the head, and pick up a small section of hair underneath the hair at the crown. Step 17 / Tie this little section to the braid to secure it against the head. The hair on top will hide the elastic band and will hold better than using bobby pins. Step 18 / Remove the elastic band from the end of the braid and unravel it. Step 19 / Grab a flat iron and smooth down the hair if desired. Step 1 / With the braid done and tied off, bring all of the hair together right above the nape of the neck. Step 2 / Add the braid into the ponytail last so it doesn’t get buried underneath other hair. Step 3 / Tie the hair together into a ponytail with a hair band. Step 4 / Remove the elastic band from the end of the braid. Step 5 / Wrap a piece of hair from the ponytail around the hair band to hide it and tie another elastic band over the ponytail to keep the wrapped section from coming undone. Step 6 / Straighten the ponytail with a flat iron and set the style with hairspray. 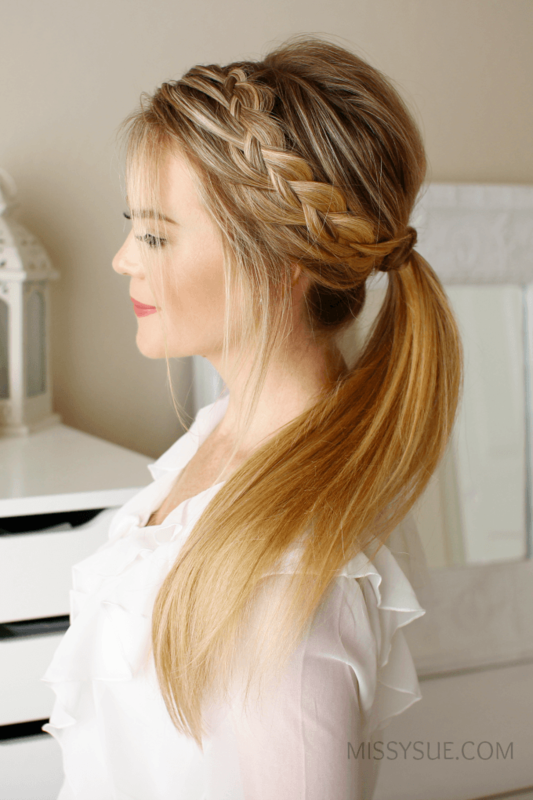 What a pretty hair style, I love the braid! I love this!!! Thanks so much!